According to the FCS record books for 2017, there are 123 Division I schools listed in the team statistical Rankings. 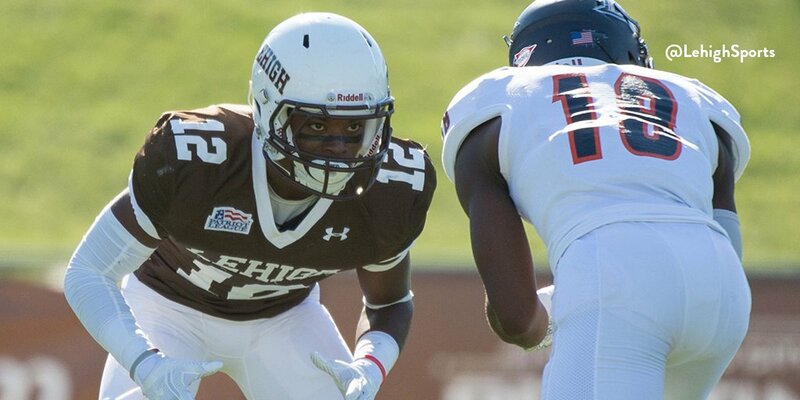 Out of 123 teams, Lehigh was ranked 119th in total team defense, allowing 477.7 yards per game. And the defensive numbers don’t get much better the more you look. Rushing defense, 117th. Passing yards allowed, 89th. Team sacks, 118th. Red zone defense, 103rd. Total sacks in 12 games: 10, or 0.8 per game. Total interceptions in 12 games: 4, or 0.25 per game. Total takeaways: 13, or a little over 1 per game. Though the final defensive numbers from 2017 are unable to be sugar-coated, nobody involved with Lehigh’s defense is running away from the facts this spring. In fact, they feel they are better than this. Lehigh Sports issued a release Friday evening that announced Lehigh’s team captains for the 2017 season. Some of the names, senior OL Zach Duffy and senior OL Brandon Short, were hardly surprises – after all, they were team captains last year. Another, senior DL Jimmy Mitchell, is a steadying leadership force on the defensive line – again, not much of a surprise. But the presence of junior S Sam McCloskey as the fourth team captain raised some eyebrows. It’s unusual to be a junior team captain, though QB Nick Shafnisky and LB Colton Caslow had been team captains as juniors. Many will look at the spring game final results and stats and see that the offense “won” this Saturday’s Brown/White game, 48-34. They’ll see a stat sheet they might expect from a Mountain Hawk team: 121 yards passing from junior QB Brad Mayes, touchdown receptions from senior WR Troy Pelletier and senior WR Gatlin Casey, as well as a touchdown run by junior RB Dominick Bragalone. But that doesn’t tell the full story of the game, played on a wet Saturday morning under mostly overcast skies. In the early portion of the scrimmage, the Brown defense racked up sacks, tipped passes and shut out the White offense for nearly an hour before Mayes would finally find Casey in the end zone. If there was any question how the new four-man defensive front might work out for the Mountain Hawks, they were answered today with a solid performance early. Last season, a disappointed LB Colton Caslow talked about the Lehigh defense after a top 26-21 loss to nationally-ranked Villanova. Caslow, LB Pierce Ripanti and LB Evan Harvey had combined for 27 tackles against the Wildcats, but it wasn’t enough to spring the upset. Caslow’s disappointment would be the last time he’d experience that emotion after a regular-season football game, as Lehigh then proceeded to win their next nine games and the Patriot League championship. Caslow, and the defense, never averted their focus and improvement from that point forward. 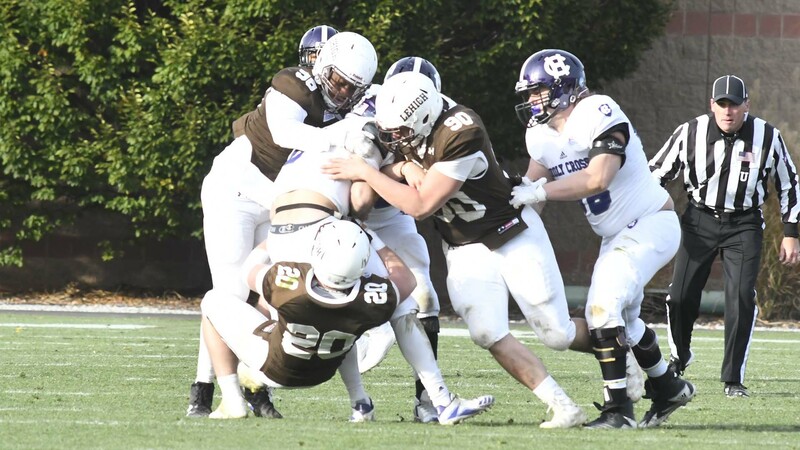 This weekend at the Brown/White spring scrimmage, we will see what the 2017 Lehigh defense will look like, but the emphasis on being in great shape and getting all eleven players to the ball will almost certainly remain. The biggest question mark on the defensive side, though, remains which athletes will step up to replace Caslow, Ripanti, Harvey, ROV Laquan Lambert and CB Brandon Leaks – and which existing players will step into the leadership positions that these seniors had as well. When Lehigh players, coaches and fans went to bed on Friday night, they probably had visions of the Mountain Hawks’ powerful offense attacking, and overwhelming, Bucknell to coast to a share of a Patriot League Championship and the conference’s FCS Playoff bid. About ten minutes into the game, the 7,049 fans in attendance had probably figured out that if Lehigh was going to win a championship, it wasn’t going to be won like that. It was going to have to be earned. It was going to have to be grabbed from Bucknell, smashing them in the mouth the same way they were smashing us. It cannot be emphasized enough how Lehigh had to earn every single inch of this Patriot League victory, how not easy this win really was. How the Mountain Hawks fell behind, clawed and scratched back to get the lead. How they had to stop the Bison stampede at key spots, get crucial turnovers, and fire up critical, difficult field goals by sophomore PK Ed Mish. Even extra points, normally considered automatic, took on new dramatic tension. The offense got punished on every single play up until the final couple of victory formations. But in the end, it was not only a victory, but a victory of the most beautiful, rare sort – the type of win that officially buries the past. Bucknell hardly made it easy. The Bison jumped out to a 7-0 lead, and made the lead 13-7 on the backs of touchdowns by RB Joey DeFloria and RB Chad Freshnock. With a chance to build on their lead, though, Lehigh’s defense stopped Bucknell again, and again, and again. The Lehigh Mountain Hawk defense, led by heroic performances by senior LB Colton Caslow (11 tackles) and senior LB Pierce Ripanti (10 tackles), forced two turnovers that became a field goal by sophomore PK Ed Mish and a critical stop on Lehigh’s doorstep that preserved Lehigh’s Patriot League Championship. 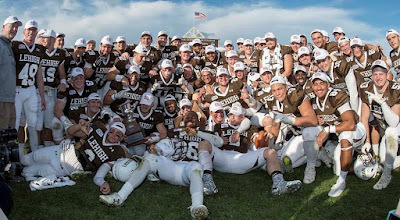 It was a fitting place, in a fitting game, for Lehigh to take this elusive Patriot League championship and to allow Lehigh to finally crash an FCS Playoff party they had been denied five years ago. They overturned their loss to Lafayette here in 2013. They overturned their 4th-and-5 at Colgate last year by a sophomore CB Donavon Harris interception that preserved the slender 7 point lead. It was tough as hell, but Lehigh got their, um, stuff together, and won the damn championship. Anyone at all worried that it’s just a wee bit too quiet from Lewisburg? I am. The narratives coming out of Bethlehem this week – emphatically, me included – are ones of possible Patriot League championships and how the offense is “clicking” and has been very, very good. That’s not usually a very good recipe for a big game for the home side, especially since word out of the Bucknell camp is very, very quiet, even though the Bison still are very much alive in the conversation of winning the Patriot League title and making Lehigh sit at home Thanksgiving weekend. Last week, Bucknell traveled to the No. 9 team in the country, Charleston Southern, and proceeded to put up a very good fight in a game that didn’t affect Bucknell’s title chances one way or another. Though the final tally was 49-28, Bucs, the Bison didn’t go away quietly against Charleston Southern’s triple-option attack, staying within a touchdown most of the way until the home team pulled away late. Want to get more worried? Look at the comments from acting Charleston Southern head coach Chad Staggs, who was in that position after head coach Jamey Chadwell served a one-game suspension. It was supposed to be RB Chase Edmonds‘ day. The questions around Lehigh, as ever, surrounded the defense. Would they be able to slow down Edmonds? Would he score two touchdowns, or three? Would they hold the almost-certain-NFL-player to only 200 yards? In all the talk about Edmonds, people forgot about two pretty good runners on the Lehigh side: senior QB Nick Shafnisky and sophomore RB Dominick Bragalone. Bragalone, for the second straight week, had another amazing game, getting 192 yards rushing, zero negative rushes, and 3 touchdowns. Shafnisky ran for 112 yards and added 3 touchdowns of his own. It would be a game where Lehigh would not need to punt – the first game since Bucknell in 1999 where that was the case. That’s because they ran over Fordham, 58-37, going up at one point 51-9 before giving up a bunch of late scores. Next week Lehigh will host Bucknell for the right to clinch an FCS playoff shot, and the chance to do no worse than tie for the Patriot League championship. I hinted at this #NarrativeStreet in yesterday’s Game Preview, but the narrative that keeps jumping to the forefront in the run-up to the game this weekend is the “disaster” – head coach Andy Coen‘s words – of last year’s game at Princeton. There were other losses in the 2015 Lehigh football season. There was James Madison, where the eventual playoff-bound Dukes impressively blew the Mountain Hawks out of the water, 55-17. The 59-42 loss to Fordham where QB Nick Shafnisky was lost to injury right before halftime. The Colgate game. The Yale game. But there was something about the loss at Princeton that really got under coach Coen’s skin that was different than the other losses – an anger at the way it happened, the way that things seemed to come apart in the second half after matching the Tigers score-for-score in in the first half. All the narratives seem to point to last year’s “disaster”, and hoping that the team has learned from it.